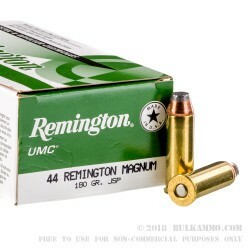 This .44 Magnum Remington UMC 180 grain jacketed soft point ammunition is a great option for self defense or target practice. The semi jacketed projectile allows the it to expand upon impact, slowing it down, and helping to keep it from penetrating too much after hitting your target as well as release as much energy as possible to the target. This projectile is housed in a brass casing and is fueled by a boxer type primer for great extraction from the cylinder and reliable ignition on every shot. It is also reloadable. 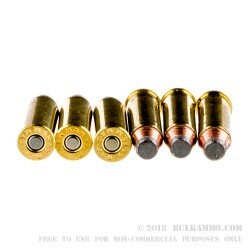 Pick up these rounds today, and be prepared for the range or self defense as they will be a great choice for both purposes. It is leaving the muzzle at 1610 feet per second out of a 4 inch test barrel, generating 1036 foot pounds of devastating energy. Even at 25 yards, it is still traveling at 1482 feet per second and generating 878 foot pounds of energy. Remington has been producing ammunition since 1871, and continues to produce their products here in the United States. 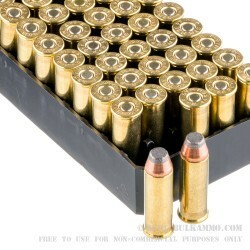 Offering anything from range ammo to ammunition for self defense and everything in between. 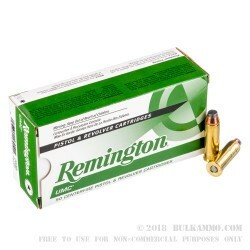 You can't go wrong with choosing this Remington UMC line of ammunition for your training or self defense needs. I made a small order that arrived on time. I'll try to order bulk in the future. First of all I would like to thank BulkAmmo for great products and the best and quickest service from any online shipment I've found and used. This may not be typical for everyone but my orders are usually waiting for me 48 hours after I place them. I am using a Ruger super Redhawk. I have shot a half a dozen different brands and the gun does just fine with all of them. Very Good, Best for the money.